With strong intention to lead the new music scene in Thailand, Piyawat Louilarpprasert founded and directed the Tacet(i) Ensemble since 2013. The purpose is to introduce and spread the contemporary music to Thai musicians and audience. Its debut was the significant step of triggering and evolving the world of the contemporary music in Thailand and, eventually, international level. Tacet(i) created variety of works, projects such as performances and premieres of Thai composers’ works, rare repertoires, as well as and collaboration with visual artists, architectures, writers and many more. For instance, a contemporary music projects and concerts, such as, “Tacet(i) First Step Concert in 2014”, a sound experiment , sound installation and performances, “CMC Experimental Sound Project No.1: Hor”, a collaborative works with Thai-artist, “Shuttling the Space “(Sponsor by Japan Foundation) and a broadcasted nationwide, “ Thai Composer and Music ” on MU Channel, The “Sound Check” Concert at Gothe Institute Thailand 2015 and “Contemporary Carols” at Siam Ratchada Hall, Recently, Tacet(i) presented a call for score collection of young-Thai composers from over the country. 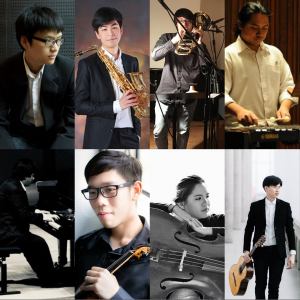 All selected works were performed in the 1st Thailand International Composition Festival 2016. The selected composers are based in Bangkok, Chiangmai, Udornthani and also from several prestigious music institutions such as Chulalongkorn University, Chiangmai University, Mahidol University, Kasetsart Universiy, Rangsit University and Princess Galyani Vadhana Institutue of Music. Currently, Tacet(i) consists of 10 – 20 Thai musicians. In addition, the ensemble has main members which includes: Pisol Manatchinapisit (saxophone), Siravith Kongbandalsuk (trombone), Pipe Kantapong (percussion), Kerk Jaree (piano), Korn Roongruangchai (violin), Kantika Comenaphatt (cello) and Noppakorn Auesirinucroch (guitar).